Do you have a furry friend? Treat them to some high quality pet food, bedding or pet treats today. Better still you won’t have to pay full price, because with Voucher Ninja we have a selection of pet discounts to choose from, saving you money each time you shop online. Browse through our selection of pets vouchers today to find the right deals for you. Over the next few weeks CJ Wildlife will be offering a special discount just for you on a selected plant each week. Every Thursday a new plant will be on offer, so remember to check back each week and make the most of some great savings for your garden..Offer changes every Thursday. Available While stocks last. This weekend CJ Wildlife are offering Free Delivery on every order placed on their website up until 11.59pm on the 14th April 2019. What will you treat your garden birds and wildlife too?.Offer ends 11.59pm 14th April 2019. Offer applies to standard delivery only. Saturday delivery charges still apply. 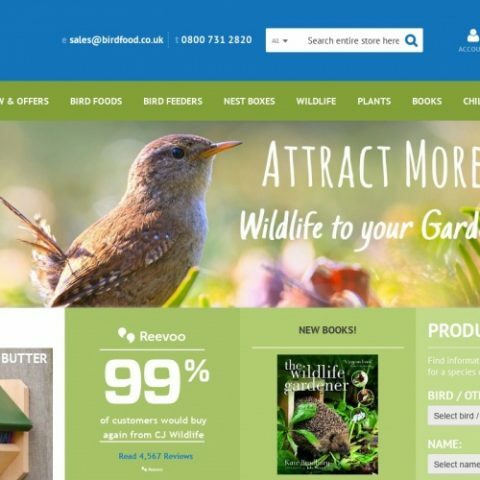 CJ Wildlife have a limited time offer just for you and your garden birds. Selected fat products now have 15% off. With the nesting season well under way, its a busy time for your garden birds so every extra calorie will make all the difference. Treat them today and help keep up their energy levels this Spring..Limited time offer. Valid until 11th April 2019. While stocks last.